At all times, continuous quality improvement is applied to ensure repeatability, traceability and control of change. This discipline enables the teams to react quickly to change requests and design improvements, as does the close relationship that we foster with our own suppliers. Our proven method of support follows a philosophy to resolve issues to the customer’s satisfaction in the shortest possible timeframe. This is achieved through our development-team structure, the ability to replicate issues in house and a suite of sophisticated tools, which allow field engineers to drill quickly down to probable resolutions. The ‘fixes’ are stored in our knowledge database so they can be applied to future projects and the entire process is transparent to our partners. Through following our ISO grade NPI process, once a product design is signed off we can confidently begin manufacture. Our manufacturing facility in Hemel Hempstead, UK, houses environmentally controlled technology suites for each product area. Housed in a single location, for optimum communication between disciplines, our tightly knit teams ensure a smooth transition from concept to initial installation. 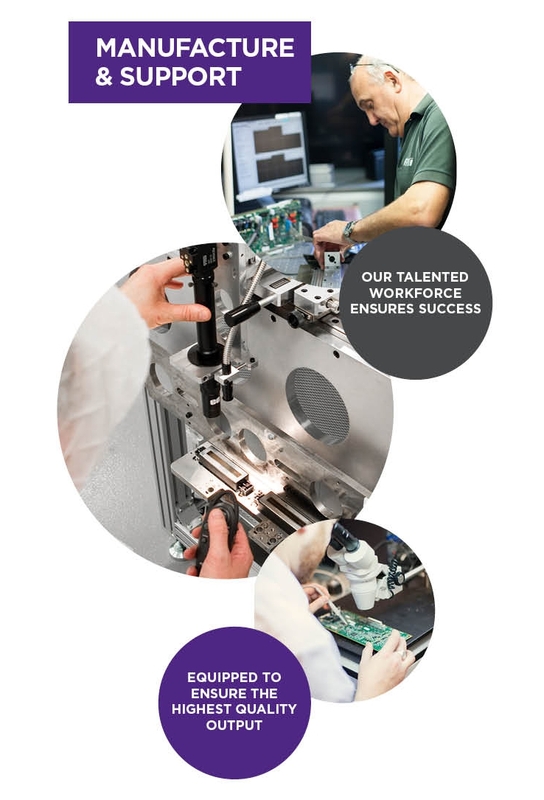 We deploy a range of corporate systems to ensure we manufacture products of the highest quality.